With a fluffy cloud-like coat, a permanent smile and an endearing desire to love and be loved, there’s no other dog we could be talking about but the charming Bichon Frise. 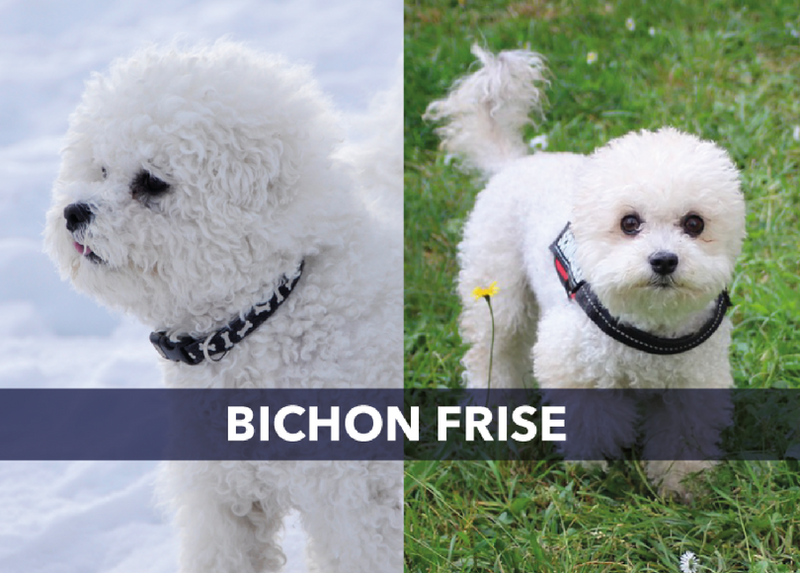 Originating from the Mediterranean countries, Bichon Frise means ‘curly lap dog’ in French. Sailors would often give the little dogs as romantic gifts to ladies they would meet as they travelled from port to port. In the 14th century, Italian sailors brought the dogs back to Italy, where they became great favourites of Italian nobility. They were also very popular in Spain, and the famous Spanish painter Francisco Goya even featured the Bichon in many of his paintings. If you’re searching for an ideal family pet then look no further. The Bichon Frise is playful, affectionate and naturally sociable. They will be at their happiest when with their family, joining in with their activities. Due to their friendly and attentive nature, this breed is quite a popular therapy dog, often visiting hospitals and nursing homes to spread smiles and warmth. The Bichon Frise is a happy-go-lucky little dog who wants to be everybody’s friend and tends to get along well with other dogs and strangers. As with all dogs, early socialisation is a key factor in making sure that they learn to be relaxed and respectful amongst other dogs, children and new people. As loving as the Bichon Frise is, this trait can sometimes be their downfall. This breed likes being around their human companions so much that they can get quite distressed if left alone for long periods of time and suffer from separation anxiety. Therefore, it’s important to get them used to being left alone for short periods from the very beginning of their time with you. Don’t let their small and fluffy appearance deceive you, the Bichon Frise is a hardy and intelligent little pooch. Eager to please and quick to learn, they’re highly trainable with a firm but fair hand. If they think that you’re angry or disappointed with them, they’ll probably take it to heart. The Bichon Frise is prone to a number of eye problems, the most common being tear staining. Discharge from the eyes tends to gather in the fur around the eyes, and so it’s important to ensure that you keep the Bichon’s face clean and hair trimmed. The Bichon Frise is quite a high maintenance breed in terms of grooming. They need to be groomed at least twice a week to keep their coat in good condition and to avoid any knots, as once matted they can become very difficult to remove. Most owners will take their Bichon Frise to the groomers on average once a month to have their hair cut, nails trimmed and ears cleaned. Historically it was fashionable to cut their fur in what they used to call the ‘lion style’, with the puffed up fur around the face loosely resembling a lion’s mane, and a ball of fur at the end of their tail. We think that’s where the lion comparisons would stop, as although quite a sturdy little dog, they are really quite sensitive souls by nature. As a petite dog, they will be quite content to live in a small apartment, but they are very active and will require a decent amount of daily exercise. One thing you may have heard other Bichon owners mention is the ‘Bichon blitz’, referring to how fast they like to run. If you have an adequately sized garden the Bichon will certainly make the most of this, and if not, please do make sure you give them ample time in the park to fully stretch their legs and enjoy burning off some energy. If it’s a carefree and cheerful companion you’re looking for, the Bichon Frise will happily assume the role of your new best buddy. What are your favourite characteristics of your Bichon Frise?